This is my old personal website (last updated in 2008). Clara.io: The online 3D editor. ThreeKit: Online 3D Product Configurators. 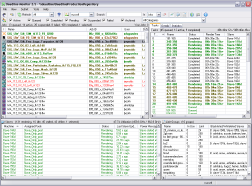 The Deadline - is a hassle free method to both administer and render on Microsoft Windows-based computer clusters of all sizes. Ben Houston led the development, marketing and sales of Deadline while at Frantic Films. Deadline is a ultra-robust render farm management system. Deadline has been used by Frantic Films on the movies Paycheck, Scooby Doo 2, Catwoman, X-Men 3, and Superman Returns, by Blizzard Entertainment on World of Warcraft, and by dozens of other VFX production houses around the world. Acquired by Amazon in 2017. "Deadline made our network rendering problems a thing of the past." Flood is a state-of-the-art level set-based fluid dynamics simulation system for the high end VFX and CG communities. Ben Houston led the research and development of the core fluid simulation technology employed by Flood as well as being responsible for its overall software architecture. The Hierarchical RLE Level Set (also known briefly as the Compact RLE level set)combines the benefits of the two previously presented sparse regular level set representations: the versatile RLE Sparse Level Set (of Houston et al. ) and the near-optimally efficient DT-Grid (of Nielsen and Museth 2005]). Houston, B, Nielsen, M, Batty C, Nilsson, O & K Museth. (2005) Gigantic Deformable Surfaces. Proceedings of the SIGGRAPH 2005 Conference on Sketches & Applications. ACM Press. The RLE (run-length encoded) sparse level set is a novel scalable level set representation. This compact level set representation, and it's ability to represent animated characters, was used in the creation of the "Tar Monster." Houston, B., Wiebe, M. & C. Batty. (2004) RLE Sparse Level Sets. Proceedings of the SIGGRAPH 2004 Conference on Sketches & Applications. ACM Press. Our contribution consists of two parts. The first part involves representing the occlusions via an augmented level set instead of the usual polygon based representations. The second aspect of our contribution consists of a technique called constrained velocity extrapolation, which uses the occlusions level set representation to better capture the subtle effects the occlusions have on the behavior of surrounding fluid. In addition to just more accurate fluid-occlusion interactions the above techniques allow for our arbitrarily shaped, moving occlusions (such as the two blue cups belong) to act as containers for the fluid. This method has since been adopted by Industrial Light & Magic to animate the semi-liquid nature of the Terminatrix villain of Terminator 3. Houston, B., Bond, C., & M. Wiebe. (2003) A unified approach for modeling complex occlusions in fluid simulations. Proceedings of the SIGGRAPH 2003 Conference on Sketches & Applications. ACM Press. 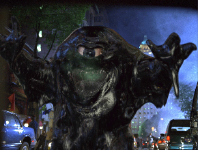 Application: Tar Monster in "Scooby Doo 2"
Creating the Tar Monster presented a unique challenge, because the desired effect of a continually flowing textured character with expressive features had never been done before. Application: Realistic Wispy Smoke for "Cursed"
For several scenes in Cursed, Wes Craven's latest film, Frantic Films was required, during post-production, to insert wispy smoke whenever the werewolves touched silver. We describe our implementation of a flexible, artist-friendly smoke simulator capable of producing realistic wispy smoke for a production environment. Batty, C and B. Houston. (2005) The Visual Simulation of Wispy Smoke. Proceedings of the SIGGRAPH 2005 Conference on Sketches & Applications. ACM Press. Interned two summers with Visual Insights (now called Oculus Info) under the supervision of Bill Wright. Primary task included a general rewrite of a futuristic and interactive 3d battlefield command and control project and the subsequent development of features in response to requests from generals in the US military. This project was a component of DARPA's Command Post of the Future initiative and has subsequently won numerous awards. Another collaboration with Zack Jacobson: A 3D visual front end for the Autonomy search engine. It features clustering through multiple queries as well as interactive relevance filtering. Written for Silicon Graphics machines under the supervision of Michael Greenspan. It's mostly a control system with a little bit of graphics thrown on top. The program is inoperative without an attached robotic arm. Ben Houston and Hassan Masum. "Explorations in 4-peg Tower of Hanoi." Carleton University Technical Report TR-04-10, November 2004. Developed a large 3D image deconvolution (for non-confocal microscopy) and protein-collocation analysis software in conjunction with the Carleton University Department of Life Sciences. An open source C# complex number and fast Fourier transform library for Microsoft.NET. It features 2 demo applications. It has been downloaded over 30,000 times since Spring 2002. The first 3D game engine written using C# and Microsoft's .NET framework. All source available for download. It has been downloaded over 120,000 times since its release in January 2002. Real-time audio spectrograph displays component frequencies the input source source in real time. 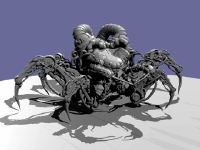 Free form deformation (FFD) is a method of smooth structural animation. It involved the warping of space using a Bezier hypercube. Written while interning at Sir-Tech Ltd, a local Ottawa games company, while attending high school. This program will shade a 2D sprite as if it was a 3D object. Written while interning at Sir-Tech Ltd, a local Ottawa games company, while attending high school. This 16 bit DOS application implements, via a x86 assembler shader routine, both Phong illumination, Phong shading, texture mapping, bump mapping and environment mapping. Performance is acceptable on a 486dx 50 MHz and memory usage is below 550kB. An original method for real-time 2D Phong bump-mapping. The code is included. Written as part of the Azure demo group. A real-time Phong illuminated, flat shaded duck. Written as part of the Azure demo group. Everyone has to render the classic Utah Bezier teapot at some point. A custom GUI based simulator which allows a person to explore the interaction of simple sine waves. Written in grade 10 using Microsoft Quick C.
A digital logic circuit construction and simulation tool. Written in grade 10 using Microsoft Quick C.
This graphical simulation of fireworks exploding and subsequently fading won a programming contest held by Nibble Magazine in June 1990.